You know you want to visit British Columbia, but you simply cannot decide which region to visit first. Do you want to walk the pulsing streets of Vancouver? Take a ferry to Vancouver Island? Or see Mount Robson, the highest peak in the Canadian Rockies, in the Thompson Okanagan region? It is so hard to decide when all the options are fantastic. Northern BC encompasses a vast part of the province! For those travellers that are interested in nature, wildlife and untouched beauty – this is a must. The main cities are Prince Rupert on the Pacific coast and Prince George located right in the middle of the province. The Thompson Okanagan Region is a place of orchards, vineyards, mountains and deserts. The wide open landscape will draw you in, inviting long hikes, spectacularly scenic rounds of golf, and some of the best cross-country skiing in the province. There are plenty of interesting museums for visitors interested in the history of the region, and friendly British Columbia innkeepers willing to share local lore. Many people think of Victoria when they think of Vancouver Island, and indeed this is a city well worth visiting. It is easy to feel lost in time when riding in a horse-drawn carriage, enjoying high tea, or staying in an historic bed and breakfast. Yet there is another part of Vancouver Island that is equally worthy of discovery: small towns, huge parks, and miles of stunning coastline. How many regions in the world offer guests the opportunity to ski in the morning and sail in the afternoon? New Zealand comes to mind. So does the Vancouver Coast and Mountains region of British Columbia, Canada. In addition to housing one of the most dynamic, multi-cultural cities on the west coast of North America, this region is by far one of the most beautiful. Snow-capped mountains soar out of the water. Misty days clear to breathtakingly beautiful panoramas. 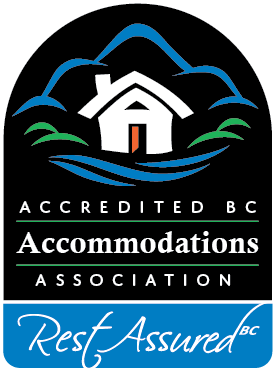 You can’t go wrong with a BC Bed & Breakfast here, or a licensed, approved self-catering lodging. This page is a good place to start researching Bed & Breakfasts in Canada’s province of British Columbia . Here you can discover a few highlights in each region, and find a BC Bed & Breakfast Inn offering the lodging amenities that suit you.